To give you a sense of scale, your electricity company measures energy in kilowatthours (kWh) and this chart is in terawatt-years (TWy). Energy use for the entire planet in 2015 was 18.5 TWy and growing! That's a lot of energy! But the solar energy available is 23,000 TWy per year - plenty to cover our demands and much more. On the other hand, notice the numbers listed for the finite sources are the total available, not per year. A little math shows just how close we are to exhausting those traditional resources. So is solar energy renewable? Not only yes, but it’s the most renewable resource we have. Even if we pretend all energy resources are otherwise created equal, it's easy to see why the Sun is such an attractive option. But most people don't know how all of these resource technologies work, let alone what they are. So let's talk about each of these energy resources to give you a better idea of why things are changing and what our future power supply could look like. In short, there are two basic kinds of energy resources: finite and renewable. The names are pretty self-explanatory. Finite resources are materials found in the earth in limited quantities. Yes, limited. Meaning they will eventually be gone! Certain new technologies may extend our ability to use finite energy resources but they’re still going to run out eventually. These finite resources include petroleum, natural gas, coal and uranium - the traditional energy mainstays. Renewable resources, on the other hand, are continually generated and won't be depleted. So that's a relief! Renewable resources include biomass, geothermal, wind, hydro and solar - the up-and-coming energy providers. If you aren't familiar with these, don't worry. We'll compare how these resources are used to create the energy that literally powers our lives. First, the finite sources (petroleum, natural gas, coal, etc.). The processes to get these fuels out of the earth and into your home are complex. But the gist is this: the material is extracted from the ground either by mining or drilling technologies and then goes through a refining process. The newly refined material is burned in order to boil water and create steam. The steam spins turbines, which generates electricity. If you want to study up on more specifics about each of these, click any of the following to learn more: Petroleum, Natural Gas, Coal or Uranium. Geothermal energy comes from hot water below the earth's surface. The water has been heated by magma, and it can be pumped directly into near-by homes for heat or into a power plant to generate electricity. Wind doesn't involve steam power, but still uses turbines. Wind turns huge windmills, which spins a generator to create electricity. You've likely seen these large windmills randomly in rural areas while driving on a long road trip. Hydropower works a lot like wind power - a natural force (in this case it's water instead of wind) turns turbines and produces electricity. Hydropower includes waves and tidal power as well as Ocean Thermal Energy Conversion (OTEC). OTEC uses the temperature difference between warm ocean surface waters and colder deep ocean water to power a turbine with vapor. And last but not least, solar energy! Solar can follow the heat-to-boil-to-steam pattern to generate electricity - this is called thermosolar. This form of solar involves solar panels, but they work more like mirrors and direct sunlight to a concentrated point to heat water. Some solar thermal systems use sunlight to heat water simply for use in factories or homes. But the more common form of solar power that is used to power homes and buildings is photovoltaic, or PV solar. The solar panels themselves gather sunlight and convert that light into energy that we can use for our appliances. No turbines here! If you want the full details, see our post that explains more about how PV solar works. 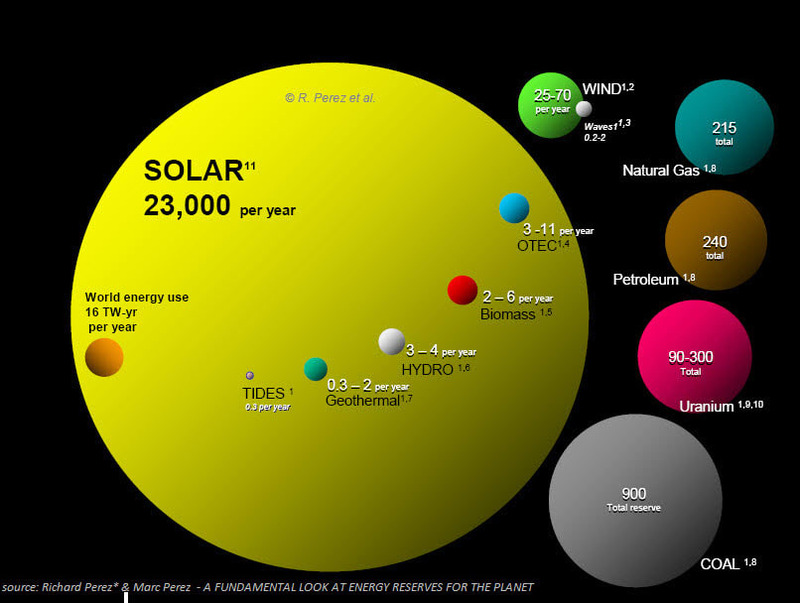 Now that we know what all these energy resources are, let's look at which resources and technologies we actually use. Remember how we saw the Sun's potential in the image above? Would it surprise you if we said it's one of the resources we use the least? 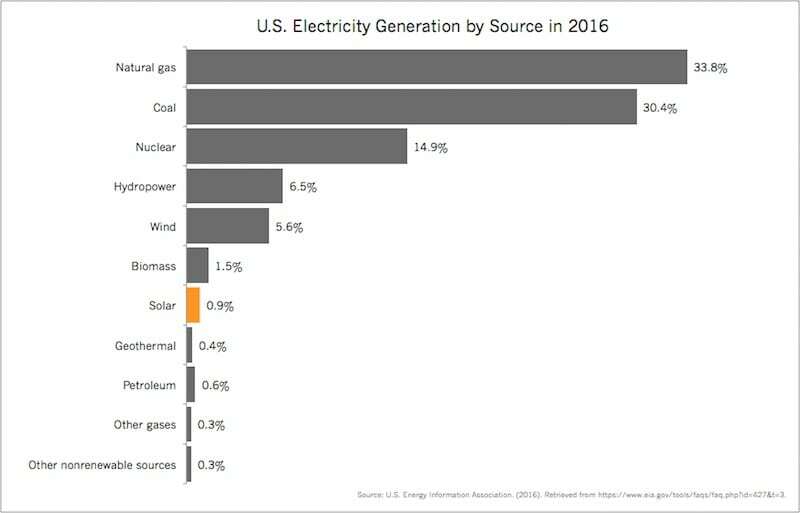 The chart below shows the U.S. electricity generation in 2017. Not even one percent of our electricity comes from solar energy! If solar isn't one of our main sources of energy (yet), then what's so great about the ones we do use? Well, there are some pros to utilizing resources like natural gas and coal, but not enough to put the majority of our energy dependence on them. The thing is, not all energy resources are created equal. Besides being finite resources, the processes that get fossil fuel energy into power lines release carbon dioxide and other pollutants. And some of our power options consume much more water than others4. Aside from the environment, there's the economy (think jobs) to take into account, too. Now that you have a clear picture of the resources that are the foundation of our country's energy industry, you can appreciate why renewable energy, especially solar, is exploding in growth. Aside from the fact that the Sun will be showering people with plentiful rays for as long as we exist, solar energy can reduce our dependence on pollutants. Who doesn't want cleaner air and water? All we have to do is embrace solar technology and use it to help us tap into the most abundant, infinite resource available - the Sun! Contact a solar provider today to see what your solar energy options are.